Stanton Peters assembles the new pipe organ in Concordia's Rogate Chapel. Concordia University Wisconsin is receiving an "organ transplant" from the Ann Arbor campus. CUW’s newest organ is a nine-rank Schlicker. It had been in storage in Ann Arbor up until a few months ago. A partially assembled, nine-rank Schlicker pipe organ is slowly but surely taking shape in the Rogate Chapel on the Mequon campus and is expected to be ready for play sometime this spring. 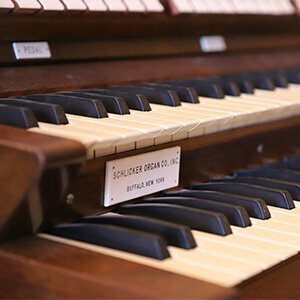 For the past few years, the organ had gone relatively undetected, sitting in a rented storage unit in Ann Arbor since the remodel of the Kreft Fine Arts Center, when it had to be removed due to space constraints. 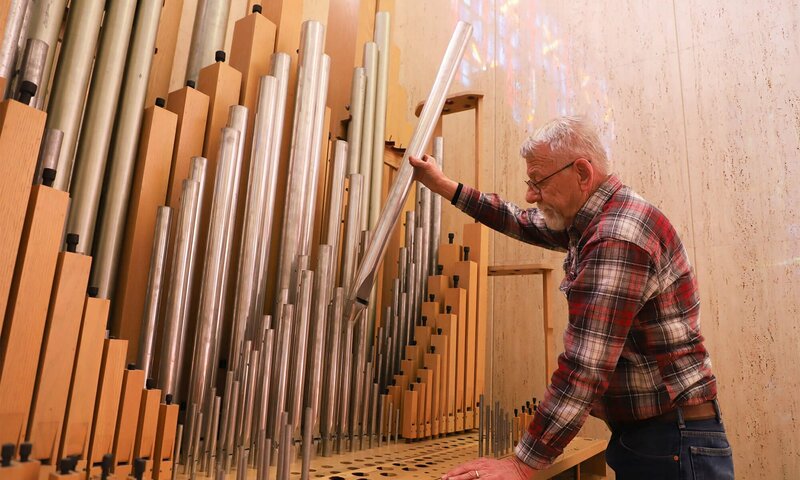 The pipe organ came to the attention of Maintenance Director Steve Hibbard earlier this academic year, and Hibbard, who studied organ as a student at CUW under Dr. John Bhenke, advocated to transport it to Wisconsin. The organ is relatively rare. There were only 10 of its model originally made, and half of those organs are now gone or non-functioning, says J. Stanton Peters, the organ builder who is reassembling the instrument for CUW. The new addition will bring the Mequon campus’ total number of organs to six, and Professor of Music Dr. Jim Freese says he’s thrilled to have another instrument for his students to utilize. 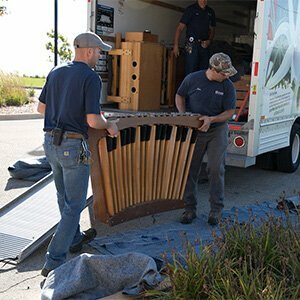 Maintenance workers haul the parts of the practice organ off the U-Haul on the Mequon campus. Concordia currently has 19 undergraduates studying organ through the Bachelor of Arts in Parish Music program, or in addition to their other areas of study, and 12 students who are enrolled in the master’s program—a healthy number for what is otherwise becoming a diminishing field of study throughout the U.S.
Freese says the Master of Church Music program with its organ, choral, and handbell emphases has become a particularly attractive option for parish musicians due to the fact that courses are conveniently scheduled over the summer. The program can be completed in as little as three years with the only on-campus time requirement schedule in intensive, four-week blocks each June and July. Because of the convenience of the scheduling and the program’s repute, Concordia draws students from all over the U.S. and of all different ages.